Watch team two started at 04:00, to Ocean Star sailing well in the dark sea. 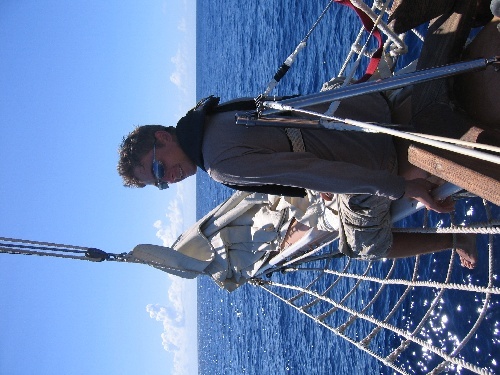 I had my first experience at the helm of a large schooner, and it took me a while to get in the groove and keep her on course. She is a giant beauty! 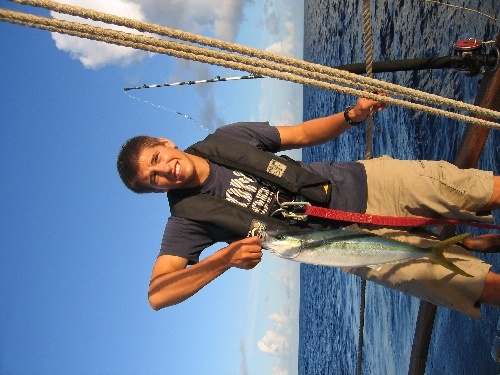 Theo, Mark and I greeted a flying fish on the bow, and threw the bright blue visitor back into the water. 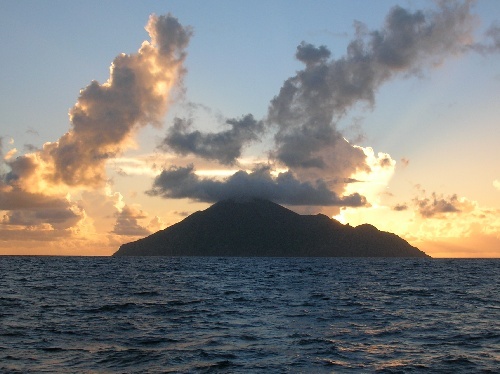 The sun rose on the port bow over the island of Saba, and our watch was relieved at 07:00. Mark caught a beautiful 16 inch rainbow runner, but released it as it wouldn’t have been good eats for the crew. 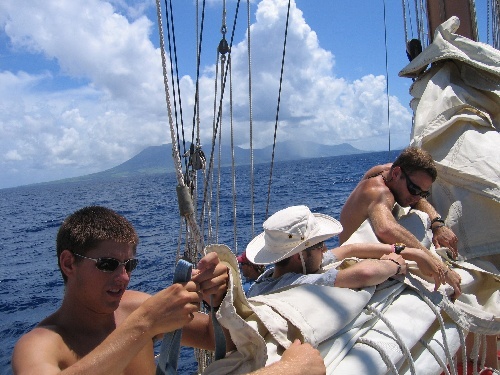 We were woken again at 12:30 and relieved Captain Simons watch to bring the boat to anchor in Nevis. While Simon and Boomer cleared immigration, the crew set about “boat appreciation”, which is a thorough cleaning and scrubbing of Ocean Star after our first passage in her. As she took great care of us, we made sure to keep her clean and happy. We then ate dinner and had our first scheduling meeting. Theo accidentally swallowed some of Dan’s crazy hot sauce, and was practically crying as she drank milk and ate bread. There were no mutinies as the crew agreed on the schedule of upcoming classes for the next week. We had some gusty wind just before bed, around 45 knots, so rolled the tarps before going to bed after the wind dropped.